Definition: Diplopia, also known as double vision, is the perception of two images of a single object seen adjacent to each other (horizontally, vertically, or obliquely) or overlapping. The two images can be side by side, on top of one another, or both. It is usually the result of impaired function of the extraocular muscles (EOMs), where both eyes are still functional but they cannot turn to target the desired object. If double vision affects just one eye, it is monocular. If it affects both eyes, it is binocular. Treatments depend on the cause and type, but they include eye exercises, specially designed glasses, and surgery. Double vision makes it difficult to see objects at any distance, and can particularly affect our spatial awareness, and therefore our ability to drive. Children with double vision may frequently cover one eye, or they may tend to squint or turn their head in an unusual way to try to see properly. There are dozens of causes of double vision, ranging from benign to life-threatening. Therefore, it is important for the doctor to carefully review the history and perform an examination to determine the cause and initiate appropriate treatment when necessary. Sometimes, emergency treatment is needed. 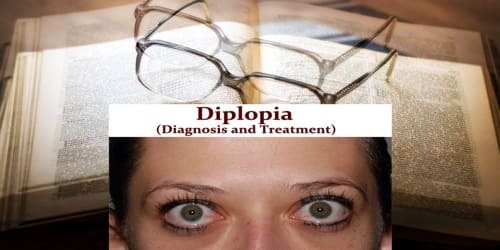 Diagnosis and Treatment of Diplopia: Diagnosing diplopia (double vision) can be challenging for an eye specialist because there are so many possible causes. A complete eye examination, which may include dilating the eyes, is performed to look for any ocular or orbital abnormalities. Particular attention is paid to the pupils and eyelid position if a neurologic cause is suspected. In some instances, specialized imaging (topography, CT, MRI, etc.) and other tests are needed to further investigate possible causes. If people suffer from double vision, their treatment will depend entirely on the type and cause of their diplopia. 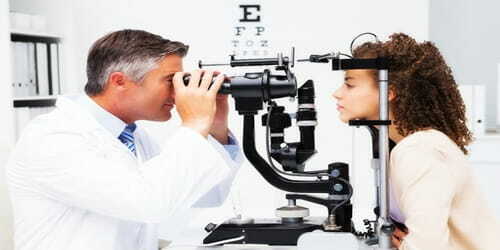 Treatment can be as simple as wearing an eye patch, or special glasses or contacts. Botox® injections or eyelid surgery may be used to correct a squint that causes double vision. Similarly, a cataract operation may be necessary if a cataract is a cause, or dry eye treatment may help if dry eye is the cause. If diplopia turns out to be intractable, it can be managed as last resort by obscuring part of the patient’s field of view. 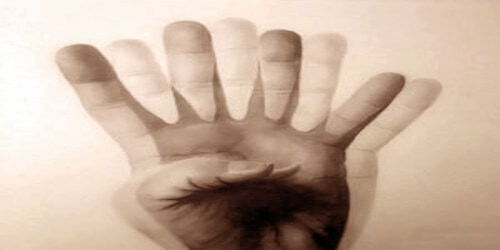 This approach is outlined in the article on diplopia occurring in association with a condition called horror fusions. Exercises cannot treat many of the conditions that cause double vision. However, some exercises can help with convergence insufficiency. Focus on a detailed target, perhaps a thin stick or small text in a magazine. Hold this at eye-level, an arm’s length away from you. Aim for the image to remain as a single image for as long as possible. Move the target toward the nose in a slow, steady fashion. The normal convergence range is 10 centimeters (cm) away from the nose. Aim to keep the image as a single image up to the 10cm mark. An orthoptist may provide a tool known as a Dot Card to assist these steps. Choose a similar target to that in the smooth convergence exercise. Start the target at a 20 cm distance from the nose. Fix people’s gaze on the target for between 5 and 6 seconds. Switch to looking at a fixed object around 3 meters (m) away for around 2 to 3 seconds. Repeat this, gradually moving the target closer, until people can focus on the object when it is 10 cm away without double vision.